Naples-based EBL Construction has completed the interior tenant build out contract for Brown and Brown Insurance’s new offices, located in Magnolia Square, a mixed-use office and retail center located at the corner of Pine Ridge Road and Goodlette Frank Road, in Naples. Courtelis Company awarded the contract to EBL Construction. The build out, which was completed in just 60 days, consisted of approximately 7,900 square feet of space. Sister company EBL Interiors provided design coordination services to Brown and Brown. 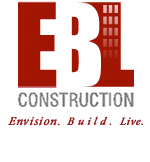 With a reputation for consistently meeting and exceeding the needs of their clients, EBL delivers unmatched build-out services and ensures the highest attention to detail at every stage of development. The firm provides construction and residential renovation services for clients throughout Florida and is also currently engaged in projects in New York, Texas and Georgia. The company’s experience profile includes the successful completion of projects in various sectors, including commercial, hospitality and residential.